Can you believe that next week is Christmas already? I sure can’t! December has just been flying by this year. I spent the whole last week getting ready for Baby Brown to arrive and guess what – she arrived Friday morning. Savannah Joy Brown made her way into the world at 10:02 AM December 11th, 2015 weighing 6lbs 13 oz measuring 20 inches long. If you would like to see a few pictures, please go to my blog emilyelizabethjoybrown.com. While we were in the hospital – I came up with a way to keep all the little mementos in one place and on display. So this week, I want to share with you a very neat keepsake ornament that I made – and how you can make one as well. You will need a large clear plastic ornament with a wide opening, 8 inches of ribbon, puff paint (optional) and various trinkets. My trinkets are the the hospital bands from Savannah, Daddy, and myself, the new born baby hat, the measuring tape used to measure Savannah cut to her 20 inches, and the umbilical cord clamp. Make sure your trinkets will all fit through the opening of the ornament. You could use a graduation tassle, notes from a loved one, pictures or any other items that you want to see hanging from your tree. All you have to do to make this keepsake ornament is remove the bulb cap, place all your items inside and arrange them so you can see all of them. Put the cap back on and loop a piece of ribbon through the top and tie it so you can hang it from the tree. Now you can use puff paint to label the bulb if you would like – I plan on putting my child’s name and birth date on the bulb but you can label yours with whatever you want. I think what is neat about this ornament is that you have all these important things in one spot that you will see every year instead of just throwing them in a box to get lost in boxes in the attic somewhere. By using a plastic ornament – you are lessening the chance that it will break and scatter the precious contents all over the place. 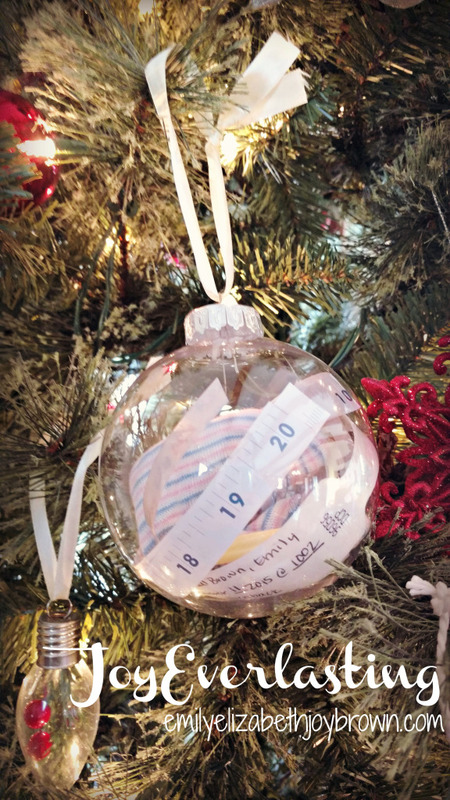 Enjoy making your very own keepsake ornament!